Long Rye Straw is the premium straw, which is used for the top racehorses in the world. Long Rye Straw is the longest straw you will find in length, and is cut with the grain head attached. This straw is highly absorbent and provides a clean appearance in the stall. 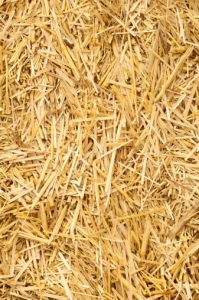 Wheat Straw is the optimal bedding for absorbency. It is commonly used among breeding farms, due to the absorbency, and shortness in length compared to rye straw. Wheat straw is harvested for the grain, and then the by-product is baled, to be used as bedding.